When I first heard of the Phylloxera epidemic that decimated the European wine industry in the late 1800’s, I wasn’t aware of its impact on the world of whisky, but I was intrigued by its history. Perhaps wine’s darkest moment was a perfect storm of scientific curiosity, scientific ignorance, burgeoning technological advancement and regional hubris. It turns out this tiny bug (Dactylasphaera vitifoliae) from the New World found a new home in Europe’s Vitis Vinifera at just the worst moment possible and in turn gave an unexpected boost to the rustic Highland spirit we’ve all grown to love. The Victorian Era, in full swing in England, and the corresponding “Belle Epoque” of France were characterized by a deeper cross-section of society gathering wealth and an education. That, coupled with the development of the steam engine, which made travel by boat and rail much quicker and much less expensive, meant more and more people were travelling further and further to explore the world around them. With botany being a fashionable pastime of the day, many scientists and amateurs travelled to the New World and returned to England and Europe with all sorts of new plant and animal specimens. Prior to the steam engine, it would have been very difficult to transport living plants across the Atlantic on a sailing ship, but now the voyage could be made in approximately 2 weeks. One plant brought back in abundance was the American grape vine (Vitis aestivalis) and with it, this diabolical little insect. The Phylloxera aphid is tiny, little more than a millimeter in length, and difficult to detect as it does its dirty work mainly on the roots of grape vines. By injecting its saliva into the roots, these little bastards convince the plant that its roots are no good, and before the plant realizes that it really needs its roots to survive, it gets rid of them. I mean really, how insidious is that? This was not a fast process either, it could take three years of increasingly stunted growth and diminished fruit production before a vine would finally die. In Europe, and specifically France, wine had reached its golden age by the mid 1800’s. Production as well as quality was at its peak when the first of three tragedies, Oidium Mildew, hit the industry. Damaging but not devastating, this powdery mildew was brought under control in less than a decade and did far less harm than the tiny critter that was just making its first appearances in French vineyards. Beginning in 1863, things started going bad in southern Rhône vineyards, and the bad spread quickly outward affecting vines in nearly every corner in Europe. It was not until 1866 that enough producers and proprietors made enough noise to attract the attention of academic scientists. 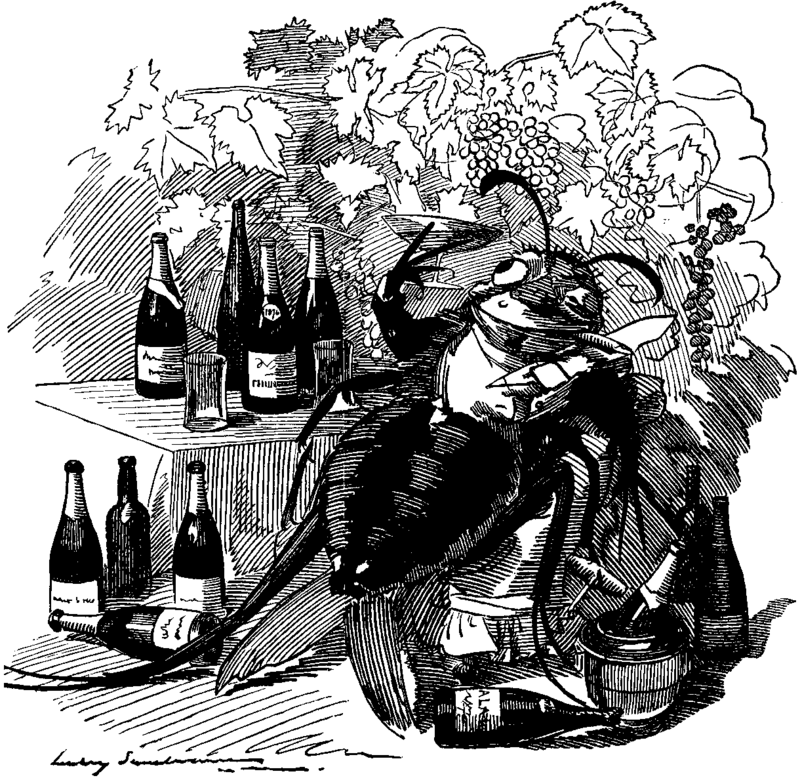 One wealthy proprietor, Gaston Bazille contacted Jules-Emile Planchon, a professor at Montpellier University and in 1868 they made the first discovery of the tiny bug they named the “devastator”, Phylloxera Vastarix. Though the number of affected and concerned parties was steadily growing, government involvement was relatively small at this point. In early 1872, just a small local prize was offered to the finder of a cure and, as was to be expected, the solutions entered were correspondingly small-minded. One of the most well-known and absurd ideas was to bury a toad under each vine…why, I have no clue, don’t ask, it was a long time ago. Exorcism, of course, was also a popular idea, as was the plan to beat on the ground around the vines, thereby scaring the little critters and forcing them to go somewhere less thumpy. Needless to say, with such little government concern, enough meaningful research just wasn’t happening. Almost a year later, the national government finally got more involved in the crisis and two main schools of thought emerged on how to deal with the now serious infestation. The most obvious and immediate course of action was to exterminate the bugs, either by flooding, to drown the little suckers, or by the use of pesticides. Both methods were costly and labor-intensive but they were mostly effective and were even used consistently into the first quarter of the 20th century. A growing number of scientists, however, were searching for a more long-term, stable solution. While the idea of grafting European vines to American root stock was coming from several quarters, it was Planchon again, this time working with American scientist Charles Riley who confirmed that phylloxera had come from American shores, that American vines were resistant and that grafting would be a viable solution. With two working solutions, European wine makers split into two camps, those wealthier and less affected chose to fumigate and exterminate, while those more deeply affected, desperate and closer to ruin would choose the more adventurous grafting. While grafting was seen as a more academically sound, long-term solution, the sheer number of American vines needed and the work and time required to acclimate these new vines to European soil was daunting. Added to this was the third tragedy to hit the European wine industry, “Downey” Mildew, which ironically came from the imported new world vines. This third plague was quickly remedied but the damage was done. The toll of this triple whammy was catastrophic. In the span of roughly 30 years, wine production in France fell by 75%. Between 60% to 85% of Europe’s vineyards were destroyed, with nearly 30% of those never to be replanted. Very few vineyards and varietals were left untouched by this period and desperate producers turned to unscrupulous means, further damaging the industry and its reputation. With the price of good wine soaring, more and more crappy bottles made their way to people’s tables, followed by crappier wine made from raisins, followed by truly desperate hooch made from fermented beet sugar and grape skins. The other fashionable alcohol of the day, brandy, suffered greatly as well, of course, being a spirit made from distilled wine. So, with the French wine industry reeling, and those of most European nations hurting as well, where did the discerning drinker turn? Scotland. The Exise Act of 1823 had further legitimized Scotch whisky and the invention of the Coffey Still in 1831 made the production of grain whisky far easier and cheaper, giving rise to the almighty Scotch whisky blend. Whisky production became a true industry in the mid-1800’s and as the wine industry faltered, Scotch stepped in to save the day. More than 30 distilleries, most of them on Speyside) were built in the last 20 years of the 19th century. By the time wine and brandy started to recover around the turn of the century, Scotch whisky had ensconced itself and was the drink of choice throughout Europe and the United States. The boom in its popularity at the end of the 19th century helped to cement its place in society, which in turn, helped it survive the low period of the U.S. Prohibition. The wine industry has obviously recovered and today we have American root stock to thank not just for clumsily named Californian wines, but for giving us most of the great French vintages as well. However, this little demon is still out there today. Phylloxera has never been wiped out completely, only controlled and though the wine industry still treats it a dangerous threat, somewhere out there’s a bunch of tiny little jerks, munching away at someone’s Zinfandel. Johnson, Hugh. “When Sorrows Come.” Vintage: the Story of Wine. New York: Simon and Schuster, 1989. Print. Robinson, Jancis. “Phylloxera.” The Oxford Companion to Wine. Oxford: Oxford UP, 2006. Print. “Phylloxera.” Wikipedia, the Free Encyclopedia. Web. July-Aug. 2010. Yeah, I love this kind of history, little arcane (or not so arcane) events which inadvertently influence other little arcane (or not so arcane) events. I hope those toads work out for you…wait…you have mosquitos in SF? You wouldn’t have thought it but I live by Lake Merced, some of the mosquitos are the size of small fowl. Enjoyed the history. Just one question. What kept this pernicious little bug from attacking Scotlands prized whisky vinyards? Could it be that Scotlands infamous weather functioned as a deterent? Could it be that Hadrian’s Wall in this circumstance was actually effective? What ever the reason, Scotland’s whisky vinyards and the prized whisky vine (whiskious maltious vintinious)continue unabated, justifying the lavish care so lovingly bestowed by those monks of old.